Jesus D. Valencia, BFA in Acting (Universidad del Valle 2008), MA in Theatre Pedagogy (UNAM 2014), MPhil (Universidad del Valle 2016), Ph.D. student, Department of Theatre and Dance, UCSB. Professional actor, acting pedagogue, theatre historian. 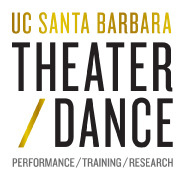 Assistant professor, Department of Theatre and Dance, Universidad del Valle. Specialized in Early Modern Europe theatre, Western Aesthetics, African, Caribbean and African American theatre.